In an era where it can often feel like our very way of life is under siege, now is the time we must unite. Now is the time to look out for one another. Now is the time to celebrate what makes our municipality a great place to live and harness that positivity in order to move into the future. Ararat Rural City Council has undergone difficulty in recent times, particularly the past two years, however under the guidance of a new administration and councillors who are committed to good governance, the organisation is ready to lead the region into the future. The time to take advantage of the opportunities we have in front of us is now. In order to move forward, we must look ahead and leave the past in the past. That is the mantra Ararat Rural City Council CEO, Dr Tim Harrison is encouraging the community to embrace. How can Council better engage with our residents is something Dr Harrison wants to continually explore. To start the process Council has met with many members of various sectors across the community to discuss issues they believe are worth raising. No matter the sector – health, industry, community, tourism, farming, lifestyle – the overall message was simple: “The need for us to work together has never been greater – what unites us should not be a shared sense of threat, but a sense of shared values”. There are many ways to contribute to the wider community, whether it’s using your business skills to support a Board, volunteering for a local cause or as simple as visiting an elderly neighbour. Jaime Batobalini knows why community spirit matters. He has seen firsthand what the impact of making someone feel included can do. Jaime has lived in the region for 28 years, having migrated from the Philippines. The welcoming nature of the Ararat Rural City is what has kept him here. “It took a while for me to settle in,” he said. “Coming from a place that was full of people and I moved straight to Moyston which is where my sister-in-law lived. Fast forward to 2018 and Jaime is president of the Filipino Australian Community of Ararat, which has more than 70 members. He said the group has helped other Filipino migrants assimilate into the community and to the way of life in ‘country Australia’. “The Filipino Australian Community of Ararat are very willing to participate in community activities, because our members feel like we are accepted in Ararat and are considered local. “Participation in as many local activities is important for everyone. We have a great community here. “People are starting to notice us around town more and more. For many years I guess we just sat back a bit and felt a bit touristy, but many of us have been here for 10, 15, 20 years. So we consider ourselves local. “We started participating in community activities with Clean Up Australia Day and now we try and support most things. Most recently we decided to really get involved in the Golden Gateway Festival. “Our Queen entrant, Megan McCarron, was named the Charity Queen for raising the most funds for her charities Legacy and beyondblue – which have been good for our group. Ararat Active8 and parkrun volunteer Tricia Ruthven can relate to that sentiment. Tricia says it is the little things the Ararat Rural City has to offer that can set us apart from the rest. “Even if you are a person that is not always out and about, even just going up the street you are going to be able to say hello to someone,” she said. “That can be pretty important in people’s lives. For Tricia, the evidence of Ararat’s community spirit is exemplified every Saturday at 8am at Alexandra Gardens where Ararat parkrun is held. “It is like its own little community now, very supportive. Everyone really does put in because it is solely run by volunteers and I think people appreciate that,” she said. “You can come this week and then may not come for another 4 months, but it doesn’t matter because it is still going to be there every single Saturday, where every person is welcome to attend. “We have mums and dads pushing prams, we have really fast runners and those that are a bit slower, people from all different walks of life. “For Ararat, that isn’t a very big town, to be involved in a worldwide event like parkrun, how lucky are we? “Council has been very supportive of Ararat parkrun from inception, and it is the little things that they continue to do. “I think Mark Bates from Council’s Parks and Gardens has done a great job lately. It is looking so good with the fountains and the flowers and everything. Probably my most favourite place in this whole town is Alexandra Gardens, I absolutely love it. For Jaime and Tricia, embracing the positivity that is on offer in the Ararat Rural City – from its people, landscape and services – means the future looks bright. “People always tend to focus on the negatives whether it is the rates issues or that our Council has been in a bit of disarray with different things lately, but that’s not the town,” Tricia said. The multimillion dollar Grampians Peaks Trail infrastructure is expected to create a tourism boon for the region. Ararat’s position as the final major centre before the national park should allow it to capitalise on the expected increase in tourism with new or improved restaurants, accommodation and support services. That is what East Grampians Health Service Chair and former Grampians Tourism employee, Nancy Panter believes. Nancy – who also runs SubRosa Wine with her partner Adam Louder – said that there are many wonderful elements that set the region apart from others, including the iconic grapes which produce world class wine. But it is the location in proximity to the Grampians National Park that really holds the key to future progression in the tourism sector. “I think tourism is an incredible opportunity for this region. However, to achieve great things we need people committed to making tourism work,” she said. “I believe tourism has an important role to play in moving our region forward and Council is a key stakeholder in that movement. “With the Federal and State Governments investing $30 million into the Grampians Peaks Trail, it will be a world class attraction and people will travel from across the globe to experience what our region has to offer. How do we make sure Ararat capitalises? Lyn Hughes, a resident of Ararat for 20 years, agrees with the potential to do more in the space. Lyn, who is now retired, spent 12 years working with Regional Development Victoria and knows the value of a working partnership across various organisations. “Where we are positioned with millions of dollars being invested in the Grampians as a tourism icon, I don’t think we sell ourselves as ‘the gateway to the Grampians’ anywhere near enough,” she said. Looking at what is best for this community and what we can build on – we need Council to be the leader in that space and the community will show their support. Splitting her time between a winery, Chairing the East Grampians Health Service Board and being a mum, Nancy appreciates the lifestyle Ararat offers. “Our son is two and the community that I have met since having Toby is really wonderful. “I feel very fortunate from a childcare perspective that there is flexibility in childcare arrangements in the region, there are some great day care facilities. I have found the services provided by Ararat Occasional Care extremely helpful. Nancy said having the confidence that her child is in good care, gives her the peace of mind to focus on other tasks, like Chairing the Board at East Grampians Health Service (EGHS) – which continues to go from strength to strength. “We’re fortunate to have the facility that we do in Ararat with the skills and expertise of the hospital staff. “Our hospital is in a strong position, but we also can’t rest on our laurels. It’s not easy to maintain a quality service to Ararat Rural City and beyond. “There are challenges, but despite that we continue to grow. While the answer may not be crystal clear, one thing is, the only way to get there as Lyn puts it ‘is through a collaborative approach’. While EGHS does continue to strive and achieve success and recognition as one of the premier regional health services, Nancy highlights recruitment and retention of staff as main cause for concern. “The hospital employees more than 400 people and that is a massive employer of the town, yet we continue to struggle to find staff – particularly doctors,” she said. “Quite often what it might come down to is there isn’t the right job for that employee’s partner. “These days with the opportunities that exist, people are training in different capacities and I actually think one of the things we need to do better as a community is work together at recruiting. “So for example, if we know someone has been recruited at AME in a senior financial position – who is their partner, what field do they specialise in and how as a network can we help them? “If only one of the two can find work, that might be okay for a year or two, but it’s not a long term solution. Nick Carthew, who is Managing Director at AME Systems, completely agrees with Nancy on the real difficulty of attracting employees into the region. Nick says the growth of AME Systems since 2013 has provided extended employment opportunities, which has led to the injection millions of dollars back into the local economy. The electrical wiring harnesses company has six factories in total – two in Melbourne, two in Malaysia and two in the Ararat Rural City in Gordon Street and its newest in McGibbony Street. Diversifying their production has created upwards of 60 percent growth in the last two years. “That is quite substantial growth and over that time we have on-boarded 242 people in the last financial year alone and over 400 people in the last two years,” Nick said. “Of those 242 people, we have managed to retain just 40 of them. It is not just Ararat, that problem is all over the country. We are even having the same issue in Melbourne sustaining staff, but Ararat is particularly difficult. “Where we are having most of our success with on-boarding people is with new Australians. We have a lot of people that are coming from India, Pakistan and the Philippians that are highly skilled, in particularly in the areas of engineering, IT and finance. Nick says AME Systems has strong growth aspirations in the next three years, which would boost employment opportunities at the Ararat sites. “Ararat is going to grow and we need a workforce pool to grow with us,” he said. “There are many areas that need to be looked at to keep up with demand, from Ararat’s education system, to hospitality to housing. “Housing is a big issue I think. If we don’t create infrastructure to address that issue then businesses like ours are going to fail. People simply can’t afford to be paying competing prices of $570+ a week rent. “That is a housing bubble that I see is going to burst at some point in time. It is not good for the town really. When it comes to planning for the future, there are many areas that need critical focus and attention paid. While housing affordability and the struggles of breaking into the market are often publicised, another issue faces home owners once they do get there – rates. The ‘rate debate’ as it has become known, has been argued at length in recent years. Ararat Rural City farmer and VFF member Charlie De Fegely has often been invited to weigh in on the conversation. For Charlie, the current rating system all local government is compelled to operate under is a flawed model and not something that can be sustained long term. “I cringe when it gets mentioned as farmers on their own or townspeople on their own, I think does it have to be like that?” Charlie said. “I think the rating strategy is a model that is broken. Not only broken for the farmers, but rural city people as well. I hope people remember that I fight for both, not just the farmers. When it comes to planning for the future, there is one model that Charlie is convinced is the only way forward and that is simple – if we don’t work together we won’t get success. “There is mixed emotion out there at the moment. In terms of how the farming community rates the greater rural city, I think we need leadership to prove that. “One of the most urgent issues and one that could be the most important that I would like to see happen to benefit our long-term future is increasing Ararat Rural City’s road expenditure by 50%. Charlie highlighted the East Grampians Pipeline as another project that was key to helping future proof the Ararat Rural City. The pipeline infrastructure would see a positive impact on a number of sectors including farming, tourism and community. “We have Climate Change that is here, it is real, it is happening and if you avoid it you do that at your peril,” he said. “That’s why it is so critical we get the East Grampians Pipeline up and going. “It is great for VFF, Ararat Rural City Council and GWM Water to be working strongly together to get this happening. When it comes to partnership, Emily Anderson knows just how valuable it is to have many seats at the table. Emily, who lives on a farm at Willaura with her husband and young family, is the Executive Officer of the Grampians-Pyrenees Primary Care Partnership (PCP). Emily said in order to achieve positive outcomes for residents, Council must endeavour to understand the needs, stories and experiences of all community members. “Until we can do that well, we can’t deliver the services that are really needed in the right way,” she said. “So community engagement is absolutely critical. 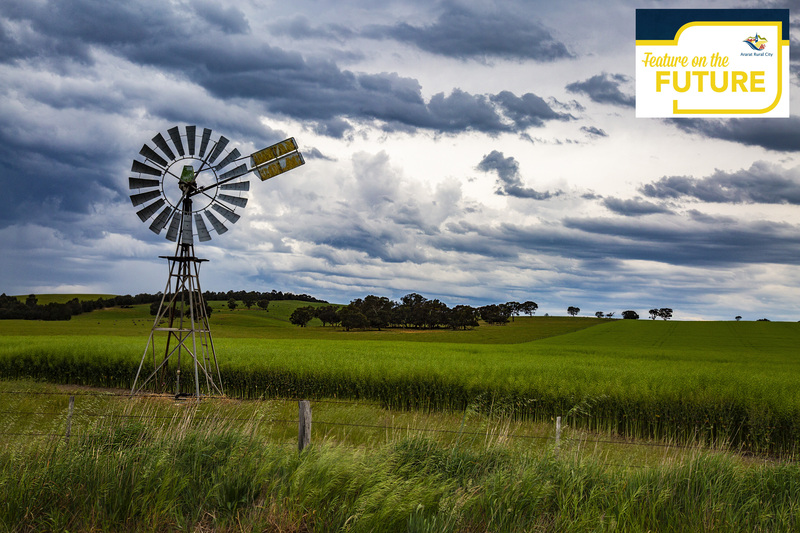 “At Grampians-Pyrenees PCP, we work very closely with the three local governments of Northern Grampians, Ararat and Pyrenees. We have had some great involvement on local health projects with Ararat Rural City Council and have done our best to support Council on their own health and wellbeing programs and projects. Emily said a great example of what can be achieved when various organisations work together is the Ararat Drug Action Team, comprised of Grampians Community Health, Grampians-Pyrenees PCP, Central Grampians LLEN, Ararat Rural City Council and Victoria Police. “Working together we have listened to the community and developed a plan of action focusing on youth and alcohol. We are now working towards rolling out an education program for year 6 students before they transition to high school,” she said. The message coming from the vast majority of the Ararat Rural City community is clear. Great opportunity awaits us if we look ahead and not back. If we are fully prepared to work together and plan for the future, the outcomes will benefit us all. “The more we can be on the front foot with housing development, business growth, with finding the right recruitment model, we are just going to grow and grow,” she said. “The more positive forward thinking we can do in terms of what people will be needing and looking for in 10, 20 or 30 years’ time the better placed we’ll be. “We need a Council with that focus of looking outwards and upwards as opposed to looking inwards. Because of the challenges Ararat Rural City Council has faced in recent years, there has been that internal facing element and rightly so, but there now needs to be a readjustment back to that long term vision. “The more we can be strategic, look at how to appeal and be welcoming to new residents, businesses and opportunities, the better the region is going to be.